It is not surprising to hear that lower half power output is a key factor in developing higher throwing velocity. However, assessing and developing that power in order to translate into pitching velocity is not fully understood. The two ways the lower half power output (without using force plates) are commonly assessed in the standing vertical jump (vertical power in the frontal plane) and the standing broad jump (power output in the horizontal plane). A study was performed on high school pitchers ranging between 14 and 18 years old. 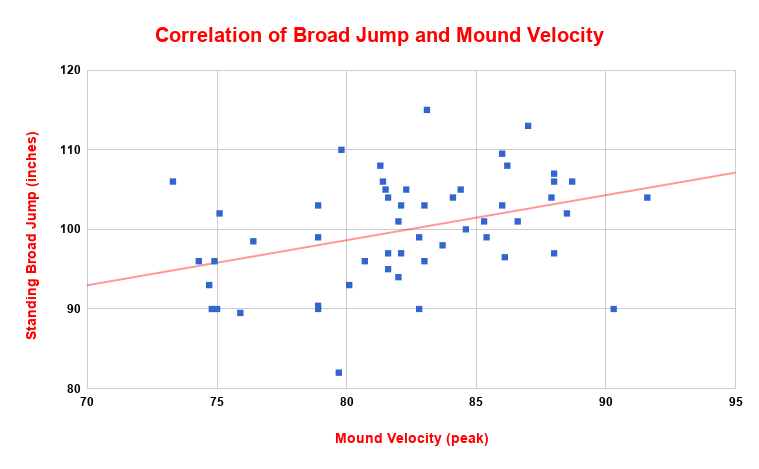 The goal of this study was to see if the standing broad jump and mound velocity had a correlation. The following results (Image 1) are from the post-testing recorded in weeks 9 and 10. Data was tracked in Week 1 and Week 9 of a 10 week Winter Program with athletes ranging 13-18 years of age. Athletes were given 5 jumps at each test date. We took this data and measured it versus their positional velocity. There are some outliers within the data, but for the most part the athletes who had more power in their lower half were throwing harder in their positional movement. 18 of the 25 athletes who threw over 80mph jumped over 100 inches. Of the 20 athletes who jumped under 100 inches, only 7 jumped under 100 inches. Not only does this take stress off of the arm by creating more power from the ground up, but it helps sustain velocity. This was just one of several tests throughout the winter programming. We also assess medicine ball velocity, lateral bounds, and 10 yard dash for power output. Assessments were recorded after a 4-week on-ramping phase that included weight training, throwing progressions, and developing mobility. Weeks 1-8 of the program included plyometrics, arm conditioning, weight training, and mobility. Post-assessment was in weeks 9 and 10 of the program. Mound velocity and standing broad jump were recorded and trained throughout the program. For the broad jump test, measurements were recorded off their back heel on a jump that was stuck without hands touching or movement in the feet. Each athlete had up to 5 jumps and the top score was recorded. The broad jump was one measurement along with others to help determine which training modalities are important to improve and/or correlate to throwing velocity so that programming can be maximized for athletes. 24 of 28 pitchers that jumped an 100+ inch broad jump threw 80.0+mph in the post-assessment. These pitchers averaged 83.8mph in their peak velocity. The average velocity for those under 100 inches was 80.5mph. The trendline shows an increase in pitching velocity (peak) compared to their broad jump (Image 1). There are also several outliers in the 2018 data that provide key information on how to program their training. A pitcher topping 90.3mph only jumping 90 inches shows a need for developing more lower half power while possessing efficient throwing mechanics and arm strength. This athlete needs a training program focused on power output and movement specific plyometrics. Another outlier was a freshman in high school who shows elite lower half output with a standing broad jump of 106 inches but currently only topping 73.3mph on the mound. He also weighs 140 pounds and needs to continue developing his physical strength. Velocity should with proper training to match his lower half power output. Our 3rd best broad jump at 110 inches only topped 79.8mph on the mound as a sophomore in high school. For him, physical strength, lower half power, and rotational power were all above average for his age. His training program should focus more on improving throwing mechanics. This data correlation was much more spread out than the medicine ball assessment which shows it can have its benefits but also shows several outliers within this testing alone. As often discussed, athleticism is a key piece of projecting an athletes potential with both velocity and performance. 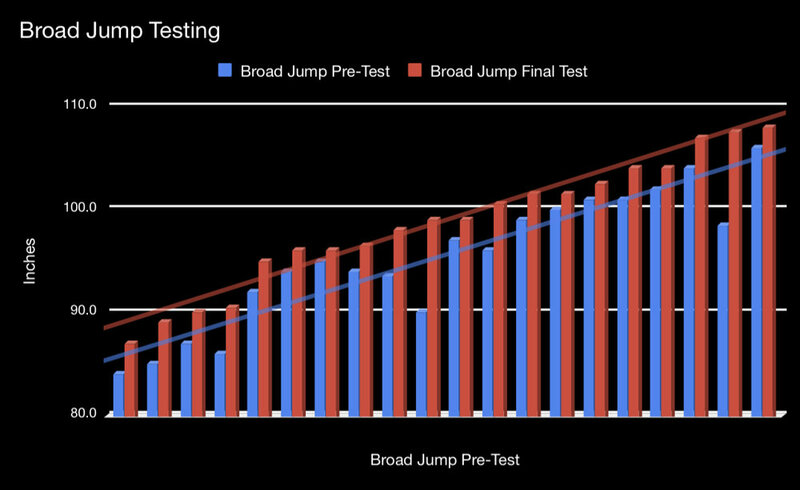 In our testing, the best broad jumpers were also some of our best athletes. Most of our best athletes also tend to produce the most velocity regardless of an assessment. Measuring, communicating, and designing programming around tests that allow coaches to learn the athletic abilities of the athletes they coach is one step to running a successful program. While the standing broad jump does not directly correlate to throwing velocity, it is one tool that coaches should use to help programming for athletes. In the future testings, the data can be collected more accurately by assessing the average jump distance instead of peak, along with velocity. Also, digesting the individual growth in the broad jump (or other assessments) along with the pitching velocity will provide important data on what helped specific athletes the most. When breaking down athletes and assessing tools, the broad jump is one great tool to learning their lower half power output and athleticism. The broad jump can also be a key assessment for organizations and programs of all levels to measure lower half power and see how it correlates with their mound velocity.